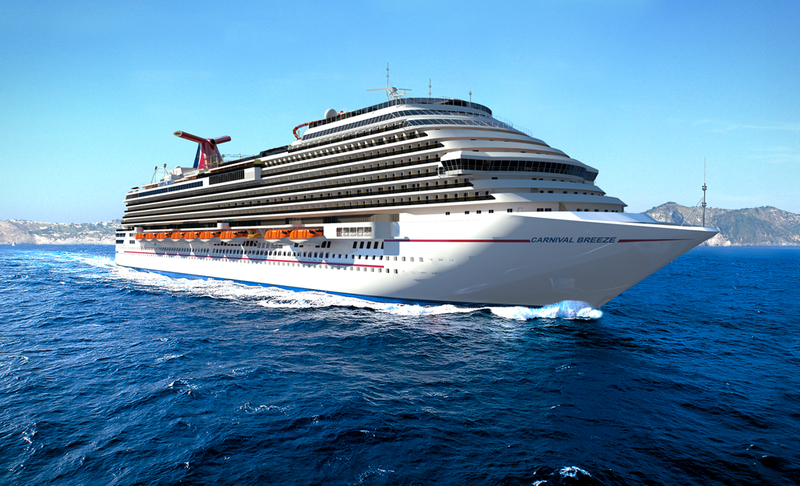 An entertaining new video hosted by Carnival Breeze Senior Cruise Director John Heald showcases the construction of the towering nine-deck-high atrium of the new 130,000-ton vessel, which is set to debut from Europe June 3, 2012. Donning a hard hat and safety shoes, Heald walks viewers through the different areas of the massive space, which will not only serve as a popular gathering spot for guests but also provide easy and convenient access to the Carnival Breeze’s many dining, activity and entertainment venues. Described by Heald as the “heartbeat of the ship,” the atrium will feature a stunning décor with colorful hanging lamps with elegant tile and wood work and a sparkling ceiling reminiscent of the starry nighttime sky. Carnival Breeze is scheduled to enter service June 3, 2012, with a special 12-day cruise from Venice to Barcelona followed by a series of 12-day Mediterranean voyages from Barcelona through October. Following a 16-day trans-Atlantic crossing, Carnival Breeze will reposition to Miami for year-round six- and eight-day Caribbean departures beginning November 24, 2012, becoming the largest Carnival Cruise Lines ship ever based at that port.